Last weekend included a mix of activities much different than my regular tasks at Niagara Real Estate and being the bank holiday weekend, there was an extra day to carry our various chores around the house. My first task of Saturday was to finish laying new ceramic floor tiles in my entrance hall. Prior to this we had crazy paved pieces of slate! NOT my favorite style. Anyway, having completed this then cut and fitted new baseboard and made way for my wife to grout the tiles (her favorite job), my next task was to make some changes to some of the plant boarders in the back yard. Having dug new trenches and re-routed the black plastic edging stuff and then backfilled with soil, etc. we then went shopping for some new plants. The best deal around was at Home Depot. As we were out, we took the opportunity to walk the dog and also pay a quick visit to Between the Lines winery for a quick tasting then to purchase a bottle as a ‘welcome’ gift for my clients who were arriving at their new home on Tuesday. Once the new plants were in and watered, it was pretty much all the energy we had left so as evening approached, we fired up the barbecue for dinner and had a bottle of the newly acquired wine to go with it. 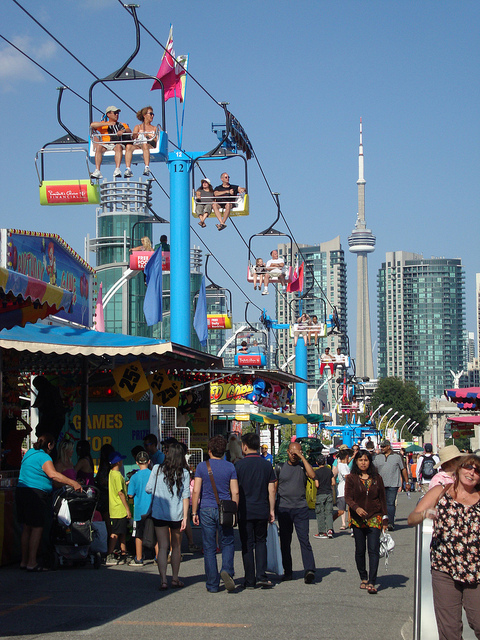 Just as I was imagining another long day of domestic work, the phone rang and friends asked us to join them on Sunday for a day at the CNE (Canadian National Exhibition) in Toronto. We accepted the invitation willingly. Sunday morning we drove to our friend’s house and picked them up then headed for the Go station in Burlington. This takes just 45 minutes so an easy trip. Having bought the tickets for the train and the CNE, we boarded the next train and headed for Exhibition Station. As we stepped off the crowded train, it looked like the whole of Toronto had turned up! 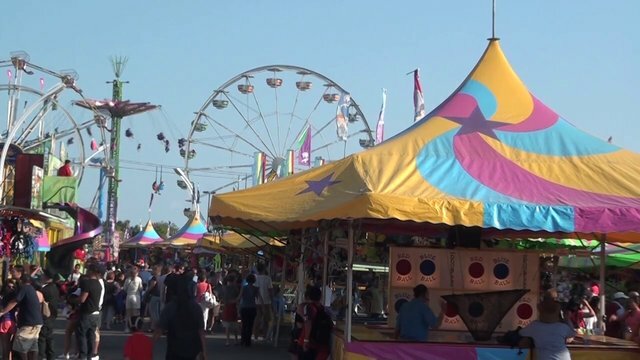 Thousands of people enjoying the rides, fun fair, corn dogs and cotton candy. We watched tight rope walkers, saw hula dancers on the International Stage, and watched the fantastic air show from the site of the old Ontario Place. There was everything from old WW1 biplanes to Harrier jump jets and everything in between. Lots of shopping opportunities and of course many food options! The zip line was a new addition and must have been a good 100 feet high – great to watch but not for me! Scared of heights! We stayed all day until around 11pm before heading back to Burlington then onto Niagara – a great day out. Living in Niagara, it is easy to enjoy weekends like these without having to travel long distances. If you are considering the move to the Niagara on the Lake area. For advice on real estate or simply to view some homes to get a feel of the area, just get in touch with me, Kevin Stokes, at Niagara Homes and I will help you make it happen. This entry was posted in Blog, Uncategorized on September 9, 2013 by wp_admin.